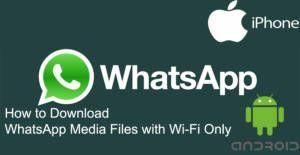 If you would like to download media files of WhatsApp with Wi-Fi connections only on iPhone and Android, you will find the detailed information about settings on this page. If you are having problem with downloading files, you can take a look at our guideline on How to Chat Online. You will need to do a few steps on iOS and Android devices. We will tell you settings of both devices on here. We hope that it will be useful for you. You will also find many useful guidelines for WhatsApp media files while you read our steps below. You can also get tips from those guides. Run WhatsApp Messenger on your Android phone or tablet. Tap on “Settings” which is located top right button (three dots). Tap on “Data Usage” on the menu which will appear the screen. You will see three options on the Data Usage Menu, we will set up your download with all these options. Tap on “When Using Mobile Data” first and remove all ticks from this menu and tap “OK” button. Tap on “When Connected Wi-Fi“, mark all options on this menu and enable downloads and then tap on “OK” button. Tap on “When Roaming” and disable any downloads if there is any for this connection and then tap on “OK” button. Now you will download all files with only Wi-Fi connection on Android device. We are going to also tell you about how to do that on iPhone devices below. You can scroll down to see that. When you are using Mobile Data and Roaming connections, you will able to still download some media files manually with your Android and iOS phones and tablets. We have already give information about how to save files manually on How to Chat Online. If you have any questions about downloading medias, please feel free to ask us through commenting this page. Tap on “Pictures” and select Wi-Fi connection from options, disable all other enabled options. Tap on “Videos“, disable all other connections but Wi-Fi. Tap on “Audios” enable Wi-Fi connection only. Tap on “Files” enable Wi-Fi connection only. Now you will able to download your files only with Wi-Fi connection on your iPhone or iPad device. If you have any question about downloads on WhatsApp please feel free to ask us. Have fun!